If you enabled VoiceOver for your iPod shuffle in iTunes when you set it up or enable it now as you synchronize your iPod shuffle, you can hear the iPod shuffle speak song titles and artist names, a menu of playlists for you to choose from, and the status of your battery charge. With a third-generation iPod shuffle, you need the Apple Earphones with Remote and Mic or the In-Ear Headphones with Remote and Mic to use VoiceOver to navigate playlists. With an iPod shuffle, you have the option to choose the language you want from the Language pop-up menu. This sets the language for spoken messages and playlist names, as well as many of the song titles and artist names. 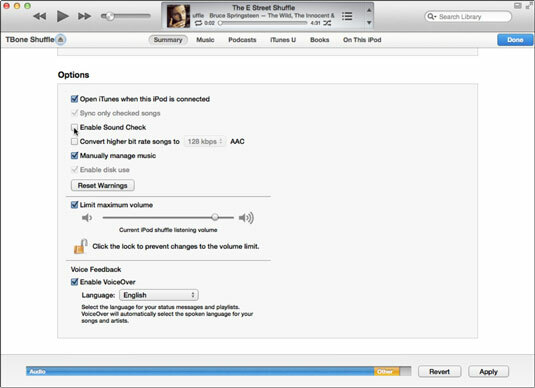 You can also limit the maximum volume of your iPod shuffle by selecting the Limit Maximum Volume option and dragging the volume setting underneath the option (and you can then lock this maximum volume by clicking the lock icon). Finally, click the Apply button to apply these settings. To hear the title and artist of the song, press the VoiceOver button on the top of the fourth-generation iPod shuffle (or press and hold the center button of the earbud’s remote controller for a third-generation iPod shuffle — and if you press the center button twice quickly to go to the next track, the next message plays as well). On a fourth-generation iPod shuffle, you can navigate after pressing the VoiceOver button to hear the info about the next or previous track. While a track is playing, press fast-forward/next to skip to the next track and hear its info; press previous/rewind to move to the previous track and hear its info. If the iPod shuffle is paused when you do this, you can immediately press the VoiceOver button or play/pause button to play the track you navigated to. To hear the playlist menu, press and hold the VoiceOver button (or the center button of the earbud’s remote controller for a third-generation iPod shuffle) until you hear the names of playlists. The playlist menu announces the current playlist (if one is playing), All Songs, other playlists in alphabetical order, Genius Mixes, podcasts, iTunes U collections, and finally audio book titles. As you listen to the playlist menu, you can press the fast-forward/next or previous/rewind button to move forward or backward in the playlist menu. After hearing the item you want, press the VoiceOver or play/pause button (or the center button of the earbud’s remote controller once) to select it. If you don’t want to choose anything from the playlist menu, you can exit by pressing and holding the VoiceOver button (or center button of the earbud controller). If you’ve synced an iPod shuffle with the VoiceOver option turned on, iTunes adds a new option to the Options tab of the Get Info dialog: VoiceOver Language. You can use it to pick a different language for specific songs. After selecting the songs in iTunes, choose File→Get Info, click the Options tab, and then choose a language from the VoiceOver Language pop-up menu. Click the OK button to finish.